Nestled in a peaceful rainforest setting, amongst the majestic paperbark trees you will find The Reef Retreat, Palm Cove. 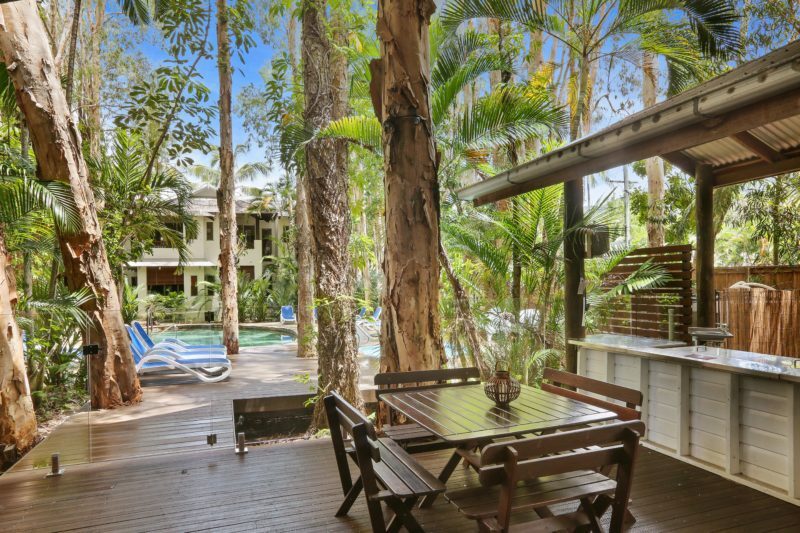 Just a 30 second stroll, 50 metres to idyllic Palm Cove beach and restaurants. Palm Cove is the jewel of Cairns Northern Beaches, a unique, quiet and relaxing village by the sea just 25 minutes drive from the Cairns Airport. 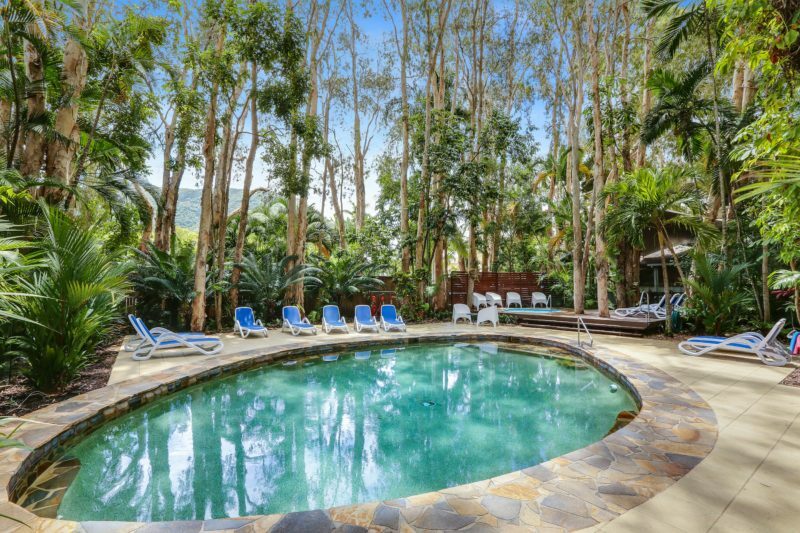 The Reef Retreat is a low rise four-star boutique style property set amongst its own rainforest of palms and majestic Melaleuca paperbark trees offering a choice of accommodation from studios, Spa suites, 1 Bedroom Suites, 2 and 3 Bedroom Apartment. Every room is designed to give you all the comforts of home complete with bedroom, bathroom, living area television/DVD Player, Ipod docks, kitchenette with stove top and micro-wave, free Cable television, free wi-fi and spacious private balconies, with views of the pool and lush tropical gardens. 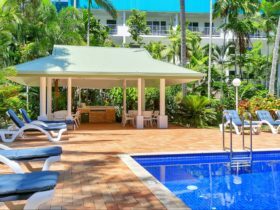 The Resort offers complimentary barbecue and entertainment area for guest use and is licensed to sell Beer, Wine and Spirits for consumption on site. 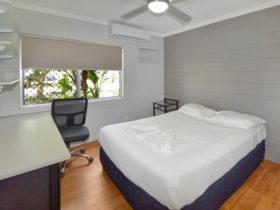 There is a heated salt-water pool and Spa Pool, free undercover car parking, free wi-fi and on site guest internet station, Guest Laundry and tour desk services are . 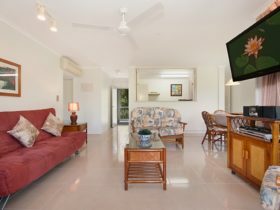 Three bedroom apartment – Comprising of 2 Bedroom Apartment & 1 Bedroom Suite interconnecting (dual key). Joins together the 2 bedroom apartment with a one bedroom suite giving 3 bedrooms, 3 bathrooms, a full-sized kitchen, 2 x kitchenettes, a full laundry, 2 x balconies and 2 separate living areas with 3 x televisions. Maximum occupancy in the 3 bedroom apartment is 8 people with 2 accommodated on roll-away beds. Located on the 3rd floor, is walk up and accessed via stairs. Located on the ground or first floor our studio suites are perfect for short stays, for the single traveler or couples. A third person can be accommodated if required. Our studios measure 45 – 47 square meters with separate but open plan living and sleeping areas. All have a king size bed with ensuite bathroom. The well-equipped kitchenettes provide a variety of cooking utensils with cutlery and crockery for 3 people and are perfect for preparing breakfast, lunch or a light dinner which can be enjoyed on your private balcony (first floor) or patio (ground floor). First floor studio suites are accessed via stairs. 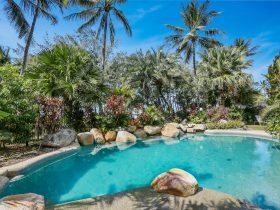 Located off-site directly opposite the Reef Retreat. The spacious self-contained Townhouses are designed to give you all the comforts of home complete with 3 bedrooms, 2 bathrooms, fully air conditioned with ceiling fans, open plan living / dining area with TV/DVD Player, full kitchen with dishwasher and micro-wave, full laundry with washing machine and dryer, FREE WIFI and your own balcony or patio with alfresco dining. Ground floor has outdoor terrace with street view or pool view. 1st floor have outdoor balcony sitting area with street view or pool view. The Townhouses offer FREE lock-up garage parking and a small salt water swimming pool. Reception and check in are at the Reef Retreat. 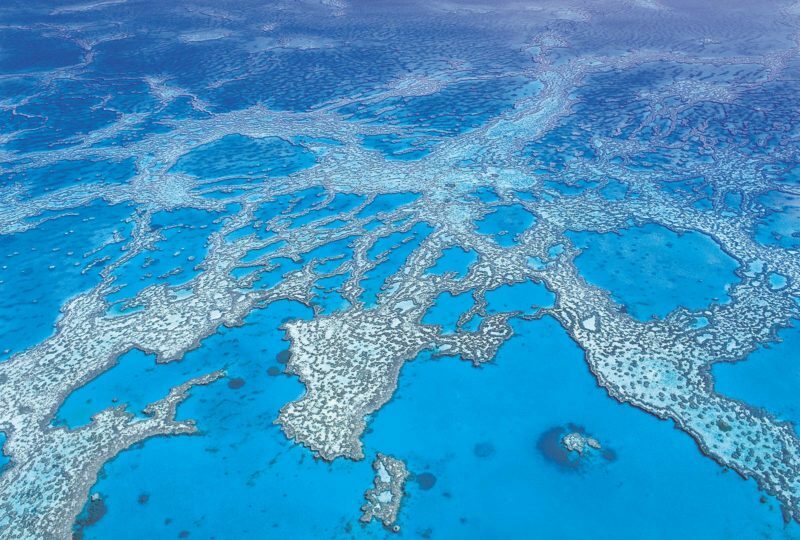 Please note the Reef Retreat and The Reef Retreat Townhouses are separate complexes. 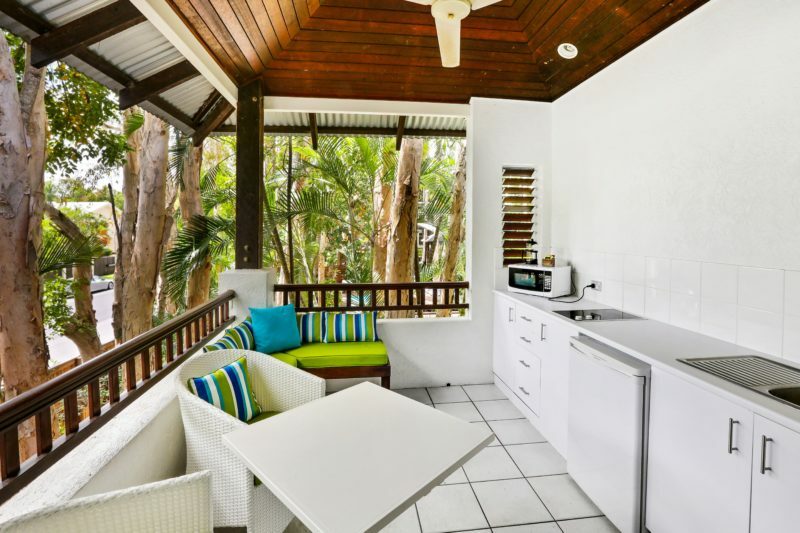 Spacious One Bedroom Suite fully Air-conditioned set amongst tropical rainforest. 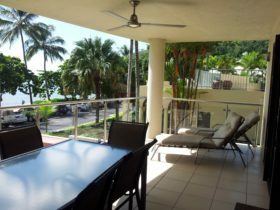 Featuring separate bedroom with ensuite bathroom, kitchenette with stovetop, micro-wave, lounge, Flatscreen TV / DVD Player, FREE Cable TV, Ipod Docks, FREE Wifi, ceiling fans and large private balcony over-looking the pool or tropical gardens ideal for outdoor entertaining. Bedding and view on request. Cot hire AUD10 per night.